Smart education and learning solutions emphasizes on the applications of mobile instruments and focuses on the mobility of the learner. In addition, it provides flexible learning process, which replaces traditional classroom teaching methods. A number of educational institutes are shifting their preference towards smart education concept by adopting high-tech teaching methods such as smart notebooks, whiteboards, and others. 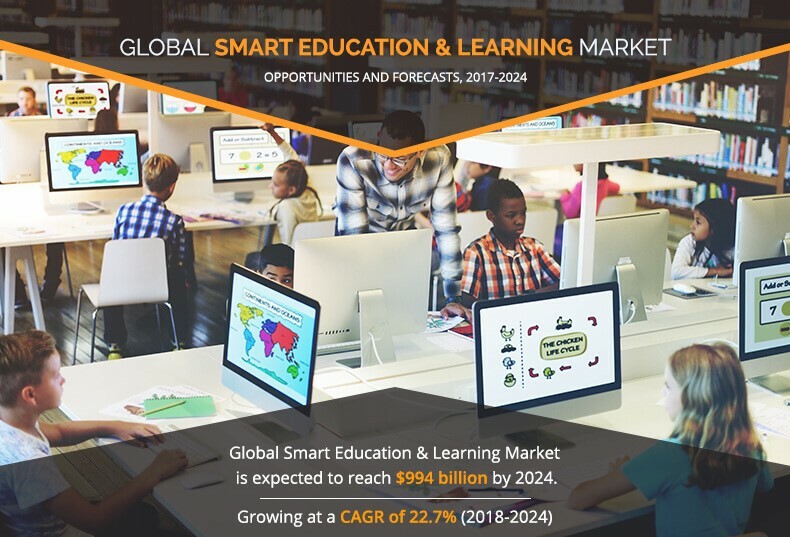 The global smart education and learning market was valued at $240 billion in 2017, and is projected to reach at $ 994 billion by 2024, growing at a CAGR of 22.7% from 2018 to 2024. Factors such as increased importance of smart education and learning solutions; rise in demand for these solutions form students, employees, and others to become digitally educated; improvement in the connectivity of handheld communication devices; increase in demand for collaboration-based learning drive the growth of the global market. In addition, rise in number of virtual schools and emergence of bring-your-own-device (BYOD) trend are expected to present major opportunities for market expansion in the near future. 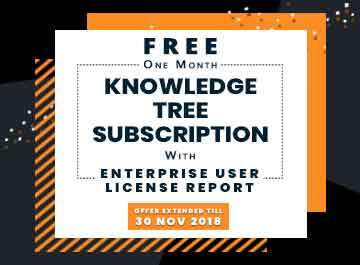 The educational content segment led the market in 2017, and is expected to continue to remain dominant in the near future however, services is expected to witness highest growth rate owing to its rising demand from the end users as it ensures effective functioning of software throughout the process. The academics segment dominated the overall market in 2017, owing to continuous ongoing improvement in educational infrastructure and customization of learning & assessment processes, due to increase in investments in digital resources however, corporate segment is expected to witness highest growth rate in forecasted period. The North America region dominated the overall market in 2017, owing to availability of adequate infrastructure and increased adoption of technologies in educational institutions in this region however, Asia-Pacific is expected to witness highest growth rate in forecasted period. Increase in importance of e-learning in corporate & academic set-ups, proactive government initiatives to promote e-learning in the developing markets, and rise in number of mobile learning applications are the major factors that fuel the smart education and learning market growth. However, factors such as security & privacy issues and high cost of implementation hamper the market growth to a certain extent. 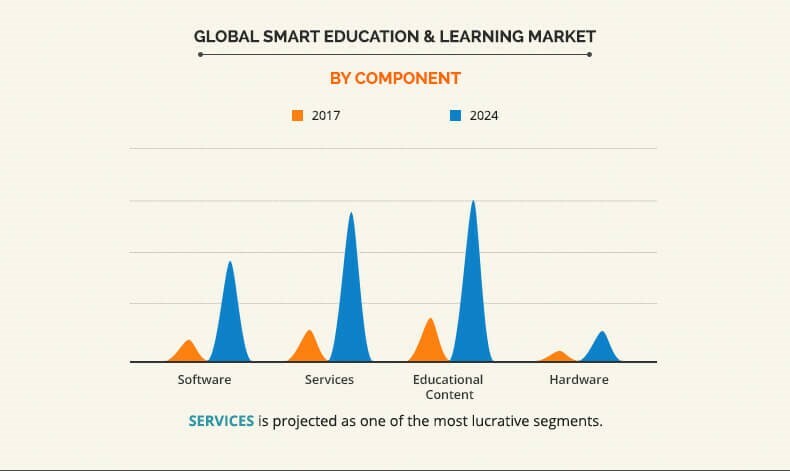 The global smart education and learning market is segmented into component, learning mode, end user, and region. Based on component, the market is divided into software, services, educational content, and hardware. On the basis of learning mode, it is categorized into virtual instructor-led training, simulation-based learning, social learning, blended learning, adaptive learning, and collaborative learning. By end user, it is divided into academics and corporate. Region wise, the market is analyzed across North America, Europe, Asia-Pacific, and LAMEA. The key players operating in the global smart education and learning market include Adobe Systems Incorporated, Educomp Solutions Ltd., NIIT Limited, Smart Technologies, Inc., Blackboard, Inc., Ellucian Company L.P., Saba Software, Inc., Unit4, Desire2Learn Corporation Ltd., and Cisco Systems, Inc.
Rise in acceptance of e-learning in corporate & academic set-ups, proactive government initiatives in the developing markets, and growth in number of mobile learning applications act as the major drivers of the market. However, security & privacy concerns and high cost of implementation are expected to hamper the market growth during the forecast period. Increase in demand for web-based and mobile-based learning platforms among corporate as well as academics institutes, including schools and universities are expected to drive the market growth during the forecast period. The adoption of e-learning software and tools provide several advantages such as reduced costs of traditionally modules that are associated with education, more revenue per trained employee, increased productivity, and others, which in turn have increased its adoption among end users. Numerous countries have taken proactive measures to increase the adoption of smart education and learning systems, which in turn is expected to provide lucrative opportunities for the market. For instance, the U.S. government actively promotes the use of e-textbooks, graphics, and other interactive smart content to enhance learning experience, primarily in the K-12 segment. The global education sector has experienced a major shift in learning models due to the burgeoning demand for mobile devices and digital education across the world. Mobile learning has become mainstream, and has completely revolutionized traditional educational business models. The adoption of mobile learning has increased in organizations as well as education institutions, due to the ease of being integrated into their business and learning models across the emerging countries such as China and India. This study includes the analytical depiction of the global smart education and learning market along with current trends and future estimations to determine the imminent investment pockets. Porter’s Five Forces analysis illustrates the potency of buyers & suppliers in the global smart education and learning industry. 8.10. Unit4 Business Software Ltd.
Smart education & learning solutions emphasizes on the applications of mobile instruments and focuses on the mobility of the learner. In addition, it provides flexible learning process, which replaces traditional classroom teaching methods. Adoption of smart education & learning solutions has increased over a period of time, as a number of educational institutes are shifting their preference towards smart education concept by adopting high-tech teaching methods. Education sector is one of the earliest adopters of e-learning, owing to increase in demand for e-learning solutions from schools and universities. In addition, dearth of quality education in the developing economies such as China and India has fueled the adoption of this concept, which is anticipated to provide potential growth opportunities for the market. Furthermore, emerging trends such as rise in popularity of gamification in e-learning, growth in use of new teaching methods, and social learning inclusion create lucrative opportunities for the smart education & learning market. Some of the key players profiled in the report include Adobe Systems Incorporated, Educomp Solutions Ltd., NIIT Limited, Smart Technologies, Inc., Blackboard, Inc., Ellucian Company L.P., Saba Software, Inc., Unit4, Desire2Learn Corporation Ltd., and Cisco Systems, Inc. These players have adopted various strategies to enhance their product portfolio and to increase their market penetration. For instance, in July 2017, Blackboard Inc. launched Blackboard Instructor, a new mobile app, which offers instructors with a simple and intuitive way to manage courses, view content, and interact with students. "Smart Education and Learning Market"